The levels of pesticides in groundwater have been decreasing, but in the flat lands of Slovenia (the basins of the Drava and Mura rivers), for which intensive agricultural activities are typical, these levels are still exceeding the quality standards. Individual point sources of pollution can be a result of the unskilled use of plant protection products in the corn weed control – corn being the most frequent crop in Slovenia. An aquifer is a geological layer that has the ability to accumulate and transfer relevant amounts of groundwater. Two types of aquifers prevail in Slovenia – aquifers with intergranular porosity (alluvial aquifers) and aquifers with karst and fissure porosity. The groundwater body is water in one or several adjacent aquifers. In Slovenia, 21 groundwater bodies are stipulated by the Rules. This indicator shows the pollution of groundwater with the total amount of pesticides and individual important pesticides in 2008 as well as trends of increase and decrease of their levels in the period 1998-2008. Pesticides that are monitored within the framework of the state monitoring programme include artificial organic compounds intended for weed control and the control of insects, pests and diseases. According to the purpose of their use, these include plant protection products (hereinafter referred to as: PPP) for the protection of crops, and to a lesser extent also biocides. They are used in agriculture and also in some non-agricultural land (sports surfaces, railway tracks, roadsides, parking places, cemeteries, parks). The remains of pesticides can often be found also in unauthorized waste dumps or in waters. The incorrect use of pesticides may cause the pollution of groundwater, which is the main source of drinking water in Slovenia. Since pesticides are harmful to the environment and health, some of them are also carcinogenic and mutagenic, the monitoring of their levels in groundwater is very important. Within the framework of the state monitoring, approximately 100 different pesticides and their decomposition products – metabolites - are analysed. – no later than by 2015, achievement of a good state of groundwater (Directive 2000/60/EC). The Decree on Groundwater Status (2009) stipulates the quality standard for individual pesticides, its relevant metabolites and the total amount of pesticides. Groundwater is over-polluted with pesticides or its relevant metabolites, if the levels are higher than 0.1 µg/L; for individual organo-chlorine pesticides from the group of drines (aldrin, dieldrin, endrin), if the levels are higher than 0.03 µg/L, or if the total amount of pesticides is higher than 0.5 µg/L. The map VD06-1 indicates the total amount of all analysed pesticides in groundwater in individual measuring points in 2008. The total amount of pesticides is not a sufficient indicator that groundwater with values less than 0.5 µg/L is not polluted with pesticides, since it can still contain some pesticides that exceed the standard 0.1 µg/L. In 2008, the standard for the total amount of pesticides was exceeded in 8 out of a total 191 measuring points, while the standard for individual pesticides was exceeded in 29 measuring points. Measuring points that are over-polluted with pesticides include 76 % of aquifers with intergranular porosity and 24 % of aquifers with karst and fissure porosity. Groundwater in alluvial aquifers is more polluted with pesticides than groundwater in aquifers with karst and fissure porosity. 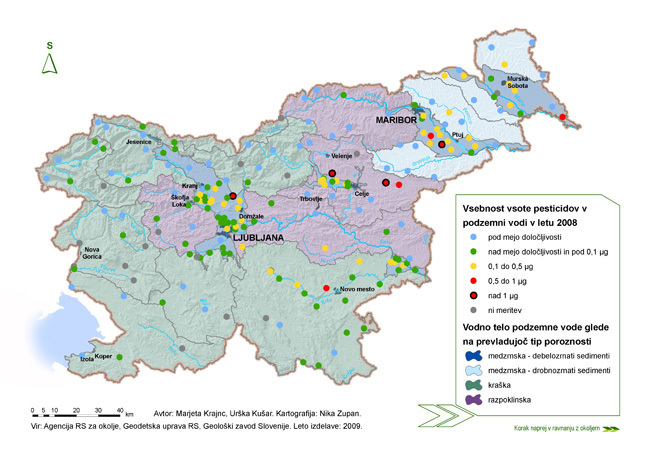 The reason for the greater pollution of groundwater with pesticides is the more intensive land use in flat land areas of Slovenia, where aquifers with intergranular porosity prevail; on the other hand, aquifers with karst and fissure porosity are partly protected due to forest coverage, smaller settlements and rare agricultural land. In the majority of groundwater bodies in the Alpine part of Slovenia, where aquifers with karst and fissure porosity prevail, the levels of pesticides were largely smaller than the limit of detection of the analytical method. The influence of fragmented agriculture on the increased levels of pesticides was determined in some areas of water bodies with non-connected and less abundant aquifers with fissure porosity (Spodnja Savinja to Sotla, Western and Eastern Slovenske gorice and Goričko), and additionally also in some Karst springs of the Karst region in Dolenjska, where high levels of metolachlor, terbuthylazine and bentazone were determined in the groundwater. The total amount of pesticides in these groundwater bodies was exceeded in measuring points at Bobovo, Pekel, under Boletina (the lower part of Savinja to Sotla) and Luknja (the Karst region in Dolenjska). Agriculture is mostly developed in North-Eastern and Central Slovenia; namely, in the flat land of river valleys (Sava, Savinja, Drava and Mura), where aquifers with intergranular porosity prevail. This is also reflected in the levels of pesticides in the groundwater. The total amount of pesticides in 2008 was exceeded also in measuring points at Moste (the Sava basin and Ljubljansko barje), Brunšvik, Kidričevo (the Drava basin) and Benica (the Mura basin) (VD06-1). In the period 1998-2008, the levels of the total amount of pesticides in groundwater bodies with alluvial aquifers were reduced (VD06-2). The Drava and Mura basins indicate a decreasing trend of the total amount of pesticides, while the statistically typical trends for the observed period were not determined in other groundwater bodies. The total amount of pesticides has been decreasing primarily due to the reduction of the levels of atrazine and its metabolite desethyl-atrazine, which is a positive effect of the prohibition of atrazine use. Instead of atrazine, other plant protection products are used; however, these are rarely determined in groundwater due to their favourable physical-chemical characteristics (fast decomposition, better adsorption, etc.). Besides atrazine, groundwater in some measuring points also contains herbicides metolachlor, terbuthylazine, bentazone, isoproturon, dimethenamid and chloridazon. In the central part of the Drava basin, the presence of herbicides, which had not been in use in agriculture for years, is also determined (diuron, prometryn and terbutryn). The annual arithmetic mean value of the total amount of pesticides decreased in the period 1998-2008 also in more polluted measuring points. 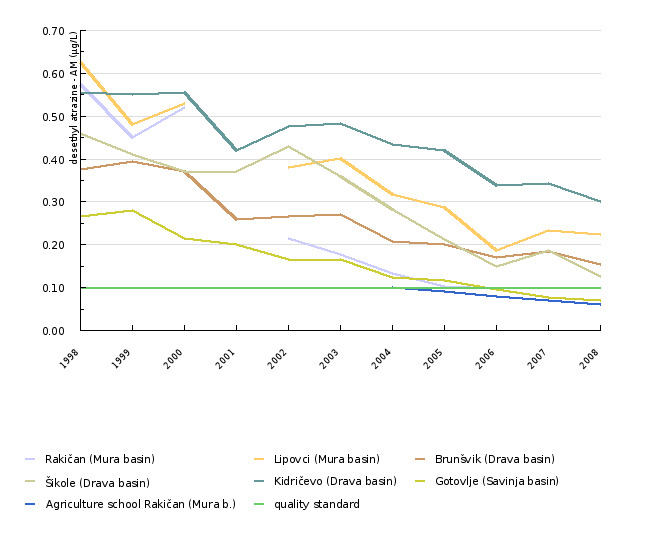 In Brunšvik, Kidričevo and Šikole (the Drava basin), a statistically typical decreasing trend of the total of pesticides was determined primarily due to the decrease of atrazine and its metabolite desethyl-atrazine. In Benica (the Mura basin), Podreča (the Sava basin and Ljubljansko barje) and Gotovlje (the Savinja basin), strong fluctuations of the total amount of pesticides can be observed (VD06-3). 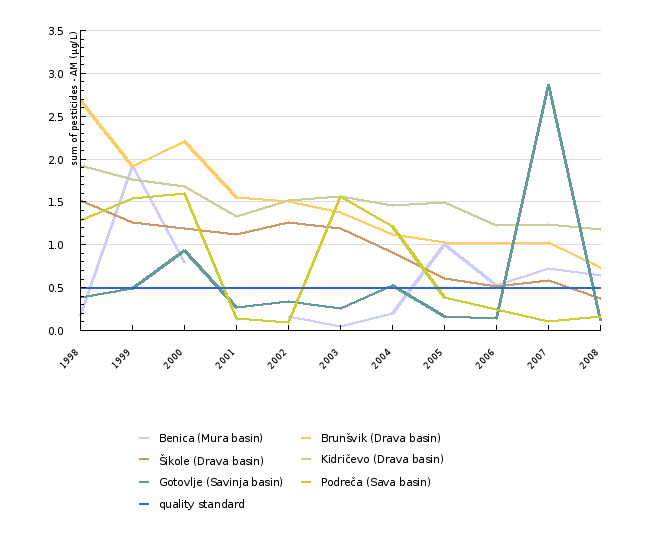 For the period 1998-2008, annual arithmetic mean values of atrazine and desethyl-atrazine, which are most frequently determined in groundwater, are indicated in the most polluted measuring points at Rakičan, Lipovci (the Mura basin), Brunšvik, Šikole, Kidričevo (the Drava basin) and Gotovlje (the Savinja basin) (VD06-4 in VD06-5). 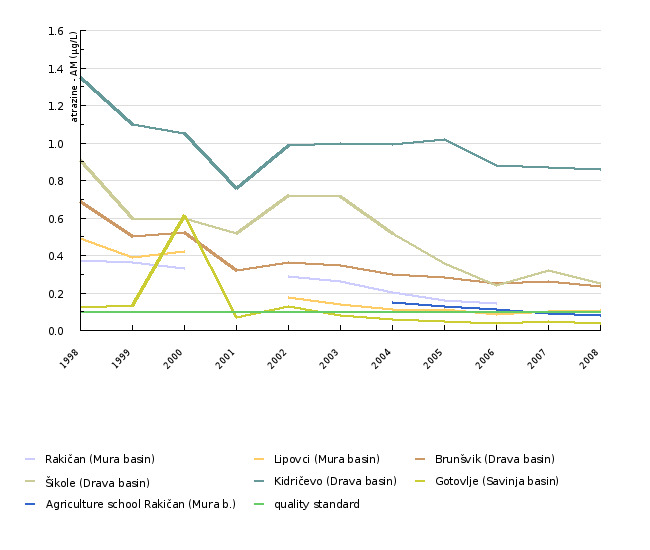 The statistically typical decreasing trend of the levels of atrazine in the period 1998-2008 was determined in the measuring points in drinking water wells Šikole and Kidričevo (the Drava basin) as well as in Rakičan and Lipovci (the Mura basin). In Kidričevo, the levels of atrazine are still very high. The levels of atrazine in the groundwater at this measuring point are significantly higher than the levels of its decomposition product desethyl-atrazine, which indicates the inflow of fresh atrazine in the groundwater. The levels of desethyl-atrazine were decreasing in all selected measuring points in the period 1998-2008; however, with the exception Rakičan and Gotovlje, the average values in 2008 were still higher than the quality standard. • The levels of metolachlor above 0.1 µg/L were determined in the period 1998-2008 at 27 measuring points (13.5 % of the network of measuring points); largely in water bodies of the groundwater of the Sava basin and Ljubljansko barje, the Savinja basin, the lower part of the Savinja to Sotla and the Karst region in Dolenjska. Metolachlor is a pesticide with fast decomposition; therefore, long-term trends in measuring points cannot be determined. In 2007 and 2008, we also determined in some measuring points its two most important non-relevant decomposition products OXA and ESA. The highest levels of the metabolite ESA (up to 4.7 µg/L) were determined in measuring points, where metolachlor has already been decomposed and its concentration was under the limit of detection of the analytical method (groundwater bodies in the Goričko, Mura and Drava basins). • We started to analyse bentazone within the framework of state monitoring in 2003. 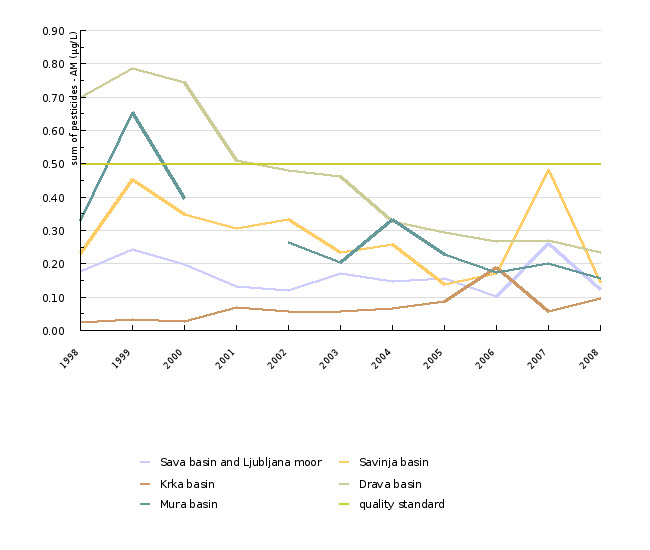 In the period 2003-2008, increased levels of bentazone were determined in 12 measuring points (6 % of the network of measuring points), largely in groundwater bodies in the Sava basin and Ljubljansko barje, the Savinja basin, the Drava basin, the lower part of Savinja to Sotla and the Karst region in Dolenjska. • Terbuthylazine is being monitored since 1990. The levels above 0.1 µg/L appeared in 7 measuring points (3.5 % of the network of measuring points) in groundwater only after 2004. • In 4 measuring points (2 % of the network of measuring points), periodically increased levels of dimethenamid, which is being monitored since 2003, were determined. The results of the monitoring of PPP remains in groundwater indicate that their correct use does not present a larger risk for the quality of groundwater. However, we must be aware that our fields have an inappropriate narrow crop rotation, which is mostly composed of corn and cereals (primarily winter wheat and barley), where mostly less than ten active substances are being used despite the wide spectrum of permitted herbicides. Despite their favourable physical-chemical characteristics, these substances present a potential danger for point pollution, primarily with their mass use. On the basis of the results of monitoring (of our and foreign research studies), it can be claimed that agriculture may continue in the entire territory of the Republic of Slovenia subject to the legislation and recommendations of good agricultural practice. However, in the future more attention will have to be paid to education and awareness of PPP users, and at the same time, competent inspection authorities will have to act in time in case of over-polluted groundwater. Objectives summarised by: Resolution on National Environmental Action Plan 2005-2012 (ReNPVO, OG RS, no. 2/06) and Directive 2000/60/EC establishing a framework for the Community in the field of water policy (EC Water Framework Directive). Methodology and frequency of data collection for the indicator: The data is presented for the period 1998-2008. The Environmental Agency of the Republic of Slovenia has at its disposal an hourly updated database. The annual data for the past year is available to the public in the first half of the next year. The groundwater quality according to the levels of pesticides is determined in accordance with the existing legislation and instructions (Decree on Groundwater Status, Methodology for determining the groundwater bodies status, Rules on Groundwater Monitoring). In accordance with the legislation, sampling in measuring points is performed 2-4 times annually. The Decree on Groundwater Status stipulates that the chemical status of groundwater is determined annually for groundwater bodies, which is groundwater inside one or more aquifers. The methodology for determining the chemical status is indicated in the Decree and methodology. Pesticides are one of the parameters that define the chemical status of water bodies of groundwater. The arithmetical mean value for each individual pesticide and its relevant metabolite as well as for the total amount of pesticides is calculated annually in each measuring point inside a water body. If the arithmetical mean values in all measuring points inside a water body of groundwater are lower than the standard, it is assessed that groundwater is not over-polluted with these pollutants. Otherwise, the share of groundwater polluted with pesticides is determined for a water body. The levels of the total amount of pesticides in groundwater in individual measuring points in 2008 and the average annual values of the total amount of pesticides in water bodies of groundwater with alluvial aquifers and in more polluted measuring points in the period 1998-2008 are indicated. The average annual values of atrazine and desethyl-atrazine in groundwater in selected measuring points in the period 1998-2008 are also indicated. Advantages: Official data that is part of the international exchange was used for the indicator. • Rules on Determining Groundwater Bodies, OG RS, no. 63/05. • Rules on Drinking Water, OG RS, no. 19/04, 35/04, 26/06, 92/06, 25/09. • Decree on Groundwater Status, OG RS, no. 25/09. • Rules on Groundwater Monitoring, OG RS, no. 31/09.